The five species of flamingos are the only animals in the Phoenicopteridae family. The only differences between the species are traits such as size, geographic range and the depth or shade of color in their feathers. 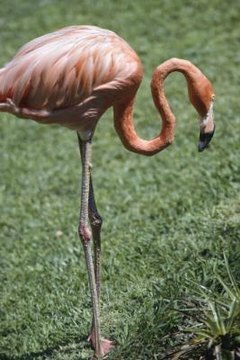 Most people associate flamingos with the greater flamingo species, which is the largest of all flamingos and has deep pink feathers. All flamingos have the same long legs and curved neck, and they honk like geese. Flamingos are very social birds and live in colonies that can number in the tens of thousands. These colonies engage in collective displays and rituals that synchronize breeding. This ensures all the colony's chicks are born at the same time and can be protected by the entire colony. After some group stretching and preening, the colony's males run together with their necks stretched and beaks pointed upwards. Females initiate copulation, which takes place in the water. Males jump on their backs to mate, leaping over the females' heads into the water once the act is complete. Up to six weeks before an egg is laid, male and female flamingos start building their nests together. Flamingo nests are mounds about a foot tall made of mud, stone, straw and feathers. Flamingos build these mounds on the ground by pushing the material together with their feet. A bowl-shaped indentation on the top of the mound houses the egg. Females usually only lay one egg, and the birds continue to add material to build up the mound as the egg is incubated. Both parents take turns sitting on top of the egg to incubate it, occasionally lifting and turning the egg with their beaks. The period of incubation lasts between 27 and 31 days. It takes between 24 and 36 hours for flamingo chicks to hatch. When they've hatched, their pink legs are thick and swollen, but the swelling goes down within 48 hours. Within a week, chicks are strong enough to walk and leave their nests for the first time. For five to twelve days chicks live in the nest, although they may walk short distances during that time. After 12 days, they join nurseries. Both parents feed the nestlings, and even after they've joined the nursery the parents recognize their nestling's call and only feed their own offspring. Chicks learn to swim before they leave the nest, and can filter-feed on their own within four to six weeks after hatching. Flamingos fledge between 9 and 13 weeks of age. Juveniles retain the gray feathers they had as chicks and don't develop adult coloration until they are between 1 and 2 years old. Young flamingos also have gray eyes for about a year after hatching, when they turn yellow. Juveniles reach sexual maturity between 3 and 6 years of age, although they don't typically breed until they are 6 years old. Flamingos reach full adult size between 1 and 2 years of age. They grow to be between 30 and 50 inches tall, depending on their species, with a wingspan of between 31 and 65 inches. Their legs are longer than their bodies, accounting for between 30 and 49 inches of their total height. The joints in the middle of their legs are actually their ankles; their knees are close to their bodies and not visible while the birds are standing. Flamingos' feather coloration comes from the food they eat. Males and females have the same coloration, which ranges in shade from pale pink to crimson depending on the species.